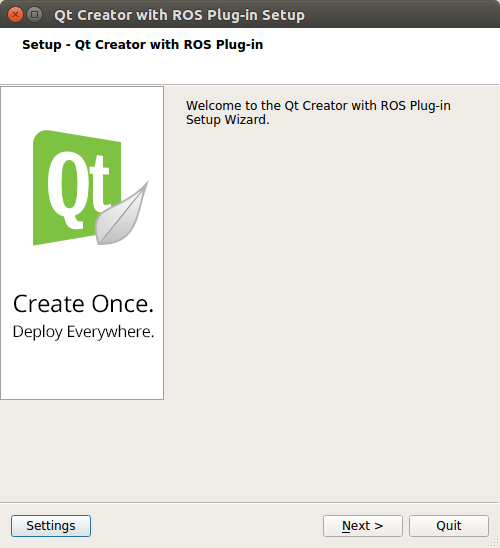 We are pleased to announce the release of the ROS Qt Creator Plug-in for Qt Creator 4.5.1 on Trusty and Xenial. The ROS Qt Creator Plug-in creates a centralized location for ROS tools to increase efficiency and simplify tasks. The installation has changed from using a debian installation method to using the Qt Installer framework. This change is to facilitate tighter integration with existing ROS capabilities and libraries within Qt Creator. Updated wiki using Sphinx and GitHub Pages to provide a richer wiki. In an effort to make it simpler when using the dugger within Qt Creator for ROS an “Attach to unstarted process” run step was created as shown below. A set of existing ROS templates were added to simplify adding ROS specific files within Qt Creator. Show hidden files/folder like .clang-format and .rosinstall. Support for catkin tools partial build capabilities. 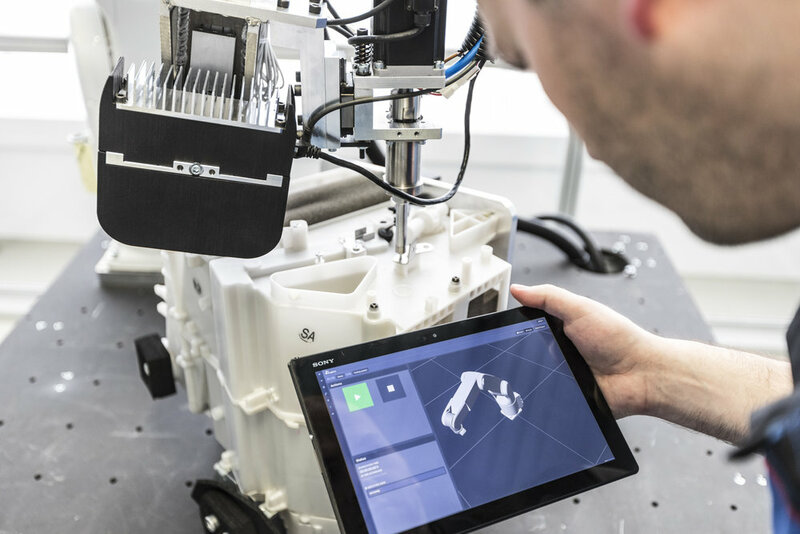 Implementing Additive Manufacturing (AM) principles with a collaborative twist is still an unexplored area of manufacturing. Traditional AM typically involves step motors moving a printing head, or a laser bonding a material to itself. More advanced solutions have even gone to mounting print heads as robotic end effectors to gain a larger print volume. A ROS framework has already been developed in this space, though additional features are always of interest. Often when a part is damaged it is either thrown out or repaired with direct labor. What if there was a way for autonomous blending part repair with AM? 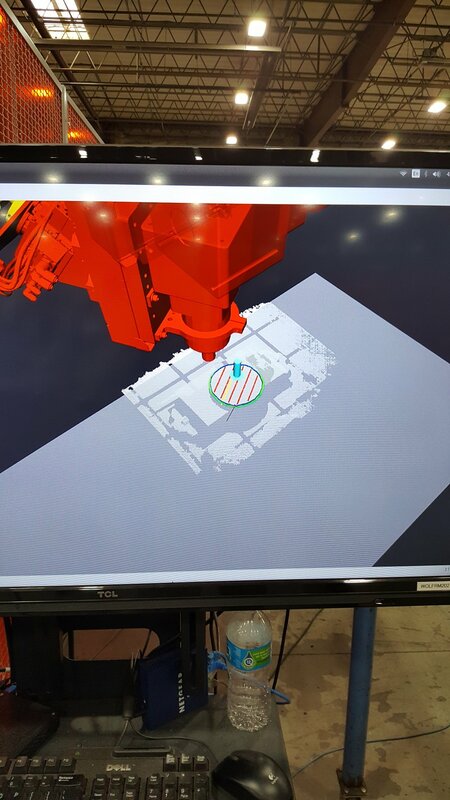 Assuming a known CAD model, a Scan-N-Plan AM solution could bring new life to previously scrapped parts. 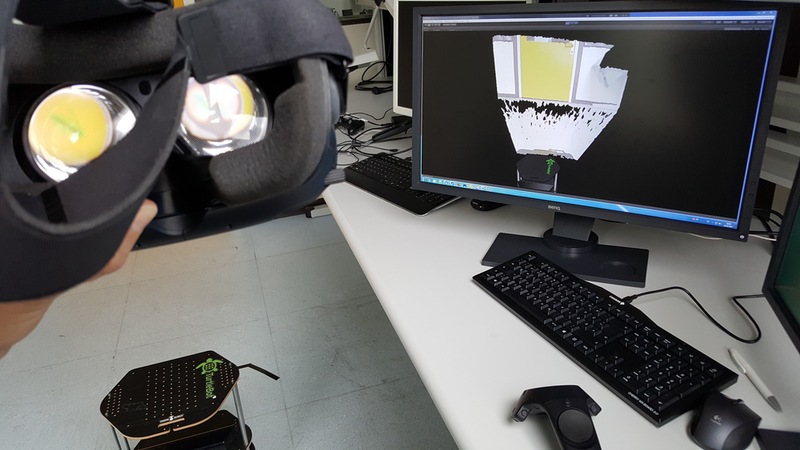 The method proposed here involves bringing in a damaged part, doing a laser scan and determine which elements of the part need repair. 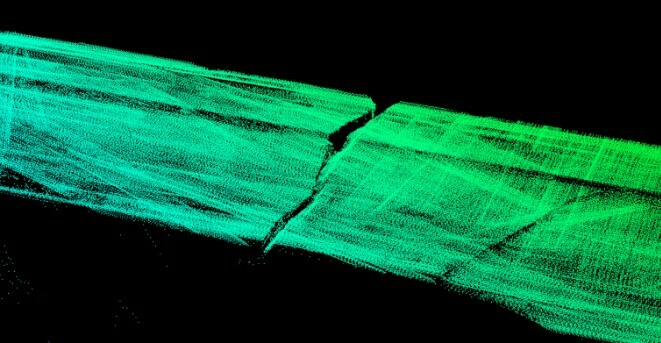 Laser scans produce good resolution of parts and is largely insensitive to material and surface quality though some cases may require several scans to achieve high resolution. A pre-scan process can easily assume this role to reduce print downtime. The scan in the image below was done on a FARO arm. As can be seen, in the image below, the quality is excellent. The file exports a point cloud that can be imported into the ROS framework. Similarly, a non-contact structured light sensor could provide the output as seen below, whereby subsequent process planning could be driven. Once the file is scanned, the part is then checked against a master CAD file. The deviation of the point clouds indicates where the flaw exists. The point cloud is then converted to a YAML file and the path is generated. Locating the part between scan and print head is done using 3 known touch off points or a non-contact form of localization. The material deposition process is then free to take place. 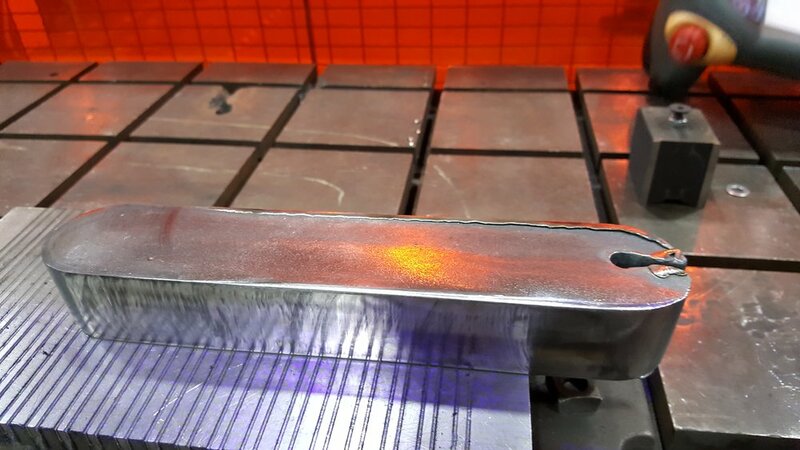 For cases such as the above example where prep-work is required to enable material deposition, a cutting or grinding tool can be process planned and executed as well to create a suitable prepared region for material deposition to occur. 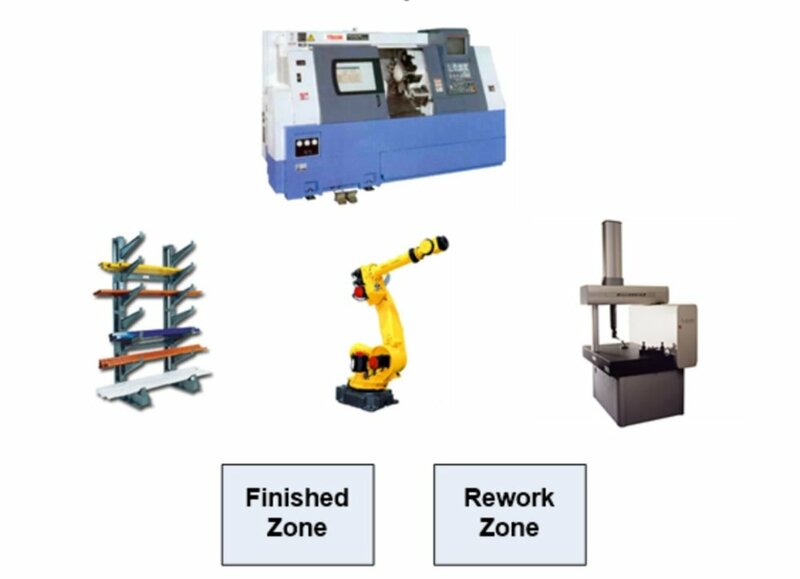 In remanufacturing use cases, specifically where the variation is high due to the unknown state of the provided material, a more efficient workflow with higher return and repurposing of field return material is possible. 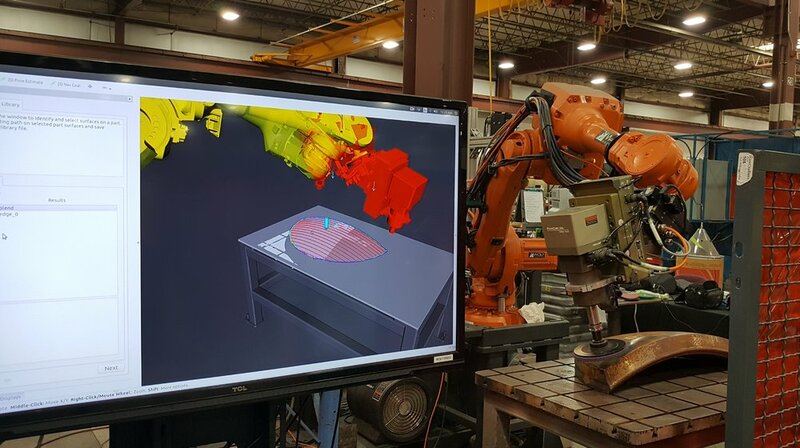 The leverage of a ROS-based framework in a distributed manner could enable common intelligence being applied over a range of assets residing at multiple sites, making process control more uniform wherever the operation takes place. Furthermore, as in the case in remanufacturing, as opposed to additive processing (building up) a complete part, leveraging the Scan-N-Plan framework enables optimization of applying only where the additive process delivers the most value in the broader context of the value stream and cost of both incoming materials and the processing itself. An example of this would be the replacement of a linkage forging on a structure with an additive deposit, where the remaining structure is fabricated plate material, the additive can be optimized to both manage load (print direction and properties), while optimizing costs where commodities do the job and are readily available at favorable costs. Issues that could arise with this process include interference with the print head with the part (oddly shaped flange interfering with a robot wrist independent of the print head) and cable management for certain types of deposition processes. Though material waste is minimal with advances in additive near-net processing, there is the cost and maintenance of the media and encompassing all of the tools that need to be accessible to the manipulator, from the QA assessment, material prep/finish/surface treatments, and of course the AM process itself. Underside printing would be a second print unless an auxiliary positioner is implemented, such as in some of the more recent hybrid additive/subtractive platforms. Physical attributes of a repair part are untested based on metallurgical properties. Part repair is still a fledging industry of research, though there have been recent advances in aerospace remanufacturing. Cohen has done some work with tissue engineering and still uses a 3-axis step motor . 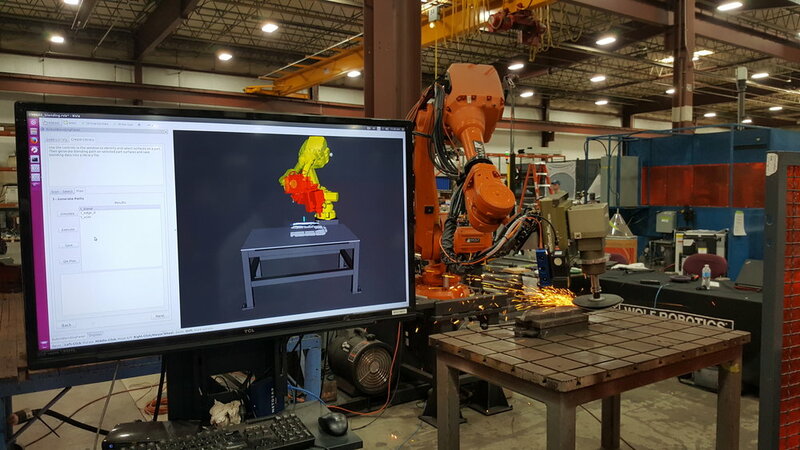 Great advances still stand to be made in this research area, however a number of tools exist to create an agile process leveraging the benefits of additive and approaches like Scan-N-Plan. 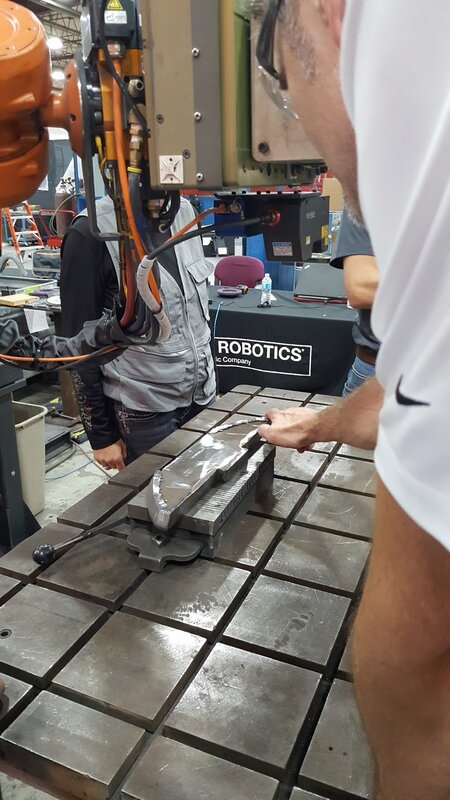 The ROS-Industrial team recently collaborated with Southwest Research Institute’s Human Performance Initiative to develop a demonstration robot for an exhibit at Arizona State University. The idea was to leverage work around their Markerless Motion Capture technology, which enables precise, 3-D capture of biomechanical movement, and merge it with the path-planning capability inherent to open-source ROS/ROS-Industrial. The demonstration would recognize a hand, and a specific open gesture of a user and this would then queue the robotic system to retrieve a part from the hand. Though this first iteration only relied on recognizing the object, the training for hand recognition is still of interest and not far off. The Human Performance Initiative (HPI) is advancing the motion capture space by improving the performance of motion capture without the need to wear cumbersome suits with the well-known “ping pong balls” attached, and a complex array of cameras. The latest developments by the HPI team involve leveraging expertise in neural networks, sensor fusion, and biomechanics to realize markerless motion capture that can be leveraged, essentially on the fly focusing initially on biomedical, sports science, and animation applications. In the manufacturing research space, there has been broad interest around understanding what people are doing in the work space. This is mostly in the context of: effective use of space, optimizing ergonomics, recording traffic patterns, predicting or enabling improved safety by understanding people movement, and quantifying the interaction between value stream efficiency and human interaction and movement. The long-term vision here would be to combine richer, dynamic biomechanical monitoring to enable gesture recognition. In this context, a robot can understand when to interact, and possibly respond based on gesture or human queue. An open palm means “take” or “place” next tool for instance, or a hybrid of verbal and physical combined on the fly by the system. This type of collaboration today is not possible due to limitations in the perception technologies in the context of human-to-human variation, both in structure (size and shape) and how humans specifically execute a gesture, such as indicating they are ready for a robotic hand to take something from them, and the anticipation of what the human may do next. In another future state you can imagine the optimal coordination of both mobile robots and humans in a complex orchestration in a high-mix manufacturing environment. Adjusting the process and the tasking of the robots even based on perceived fatigue of the human team members. 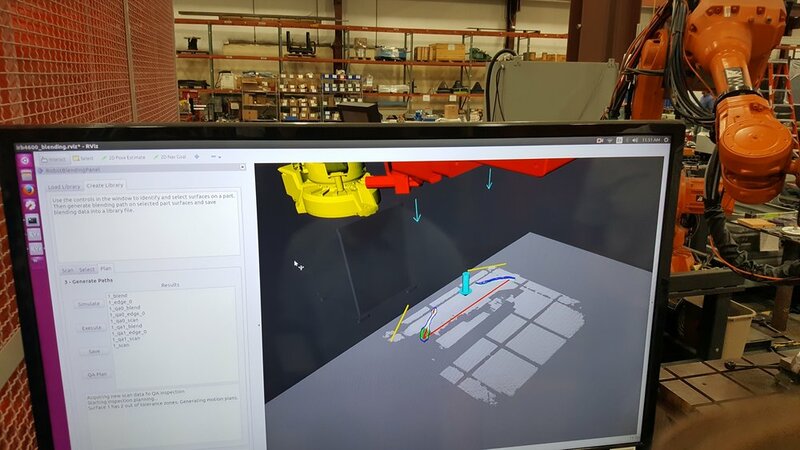 Continuous value stream, or whole plant optimization combined with this type of human performance monitoring and feedback from the automated partners enable a new paradigm for true manufacturing optimization. There are many pieces coming to maturity to enable this vision, but they need to be brought together to see what is possible. Markerless Motion Capture recognizing "Open Hand" & launching path planning to retrieve part from recent 2018 ROS-I Consortium Americas Annual Meeting. 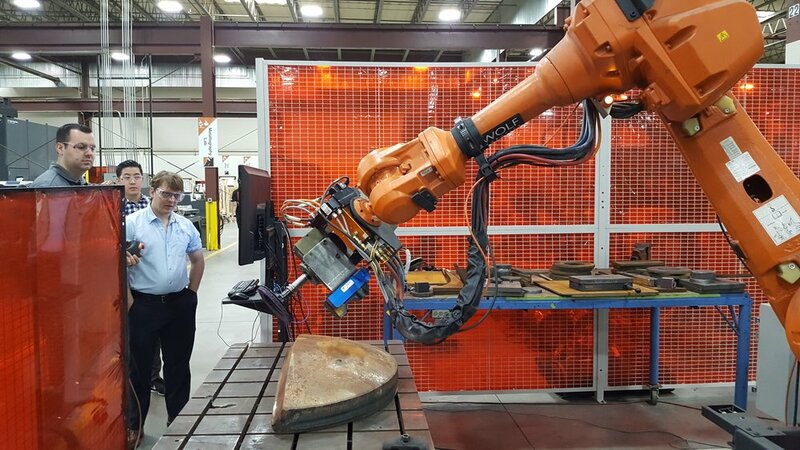 The idea of a “robot assistant” that can be an active participant in helping a worker to complete a task is still a long way off, but demonstrations such as these offer a meaningful proof-of-concept test bed, to help aid in the roadmap to realize some incremental improvement. Cross-disciplinary collaborations such as ROS-Industrial and the Human Performance Initiative can enable the ability to see what can be done by leveraging the work from each team, each with their own discrete objectives, to realize an entirely new capability set. Here at ROS-Industrial we welcome and advocate for these proof-of-concept type evaluations, and seek to provide the means to enable them. Visit the Human Performance Solutions web page for more on that team’s capabilities and offerings, and follow them on Twitter @SwRIHP. ROSIN: Why Should You Care About Quality? ROSIN is an initiative to create a set of tools to speed up ROS use and integration. “Quality” is a feature of the end product that is achieved through a set of tools and practices known as quality assurance. This is a guest blog post by Martin Bischoff on behalf of his employer Siemens AG. Thanks to Martin for the update, and to Siemens for its generous support to the ROS-Industrial Consortium! We are happy to announce that we published ROS# on github.com/siemens/ros-sharp! ...is a set of software libraries and tools in C# for communicating with ROS from .NET applications, in particular Unity. RosBridgeClient, a .NET API to ROS using rosbridge_suite on the ROS side. UrdfImporter, a URDF file parser for .NET applications. 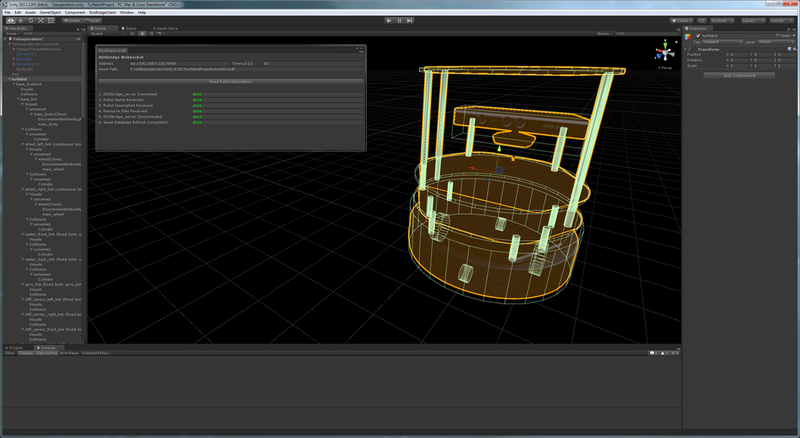 RosSharp.unitypackage, a Unity Asset package providing Unity-specific extensions to RosBridgeClient and UrdfImporter. Communicate with ROS from within your Windows app: subscribe and publish topics, call and advertize services, set and get parameters and use all features provided by rosbridge_suite. Import your robot's URDF model as a Gameobject in Unity3D. Import the data either directly from the ROS system using the robot_description service or via a URDF file that you copied into your Unity Asset folder. Control your real Robot via Unity3D. 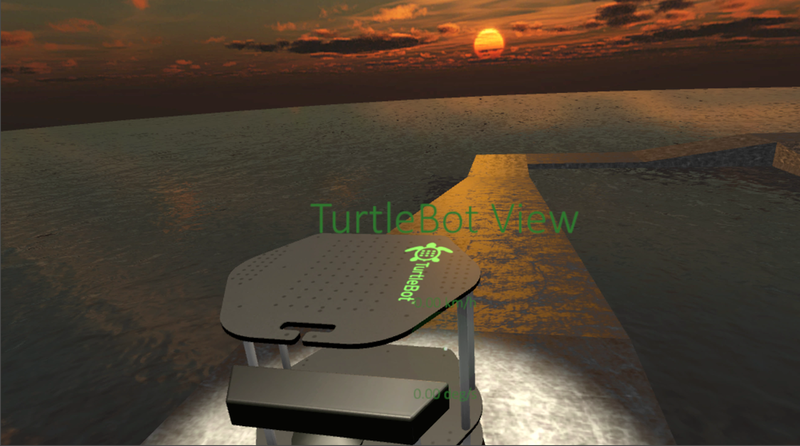 Visualize your Robot's actual state and sensor Data in Unity3D. Simulate your robot in Unity3D with the data provided by the URDF and without using a connection to ROS. Beside visual components as meshes and textures, also Joint parameters and masses, CoMs, Inertia and Collider specifications of Rigidbodies are imported. And much more! ROS# is useful for a wide variety of applications. Think about Machine Learning, Human-Machine Interaction, Tele-Engineering, Virtual Prototyping, Robot Fleet Operation, Gaming and Entertainment! Please do not hesitate to try it out yourself and to get in touch with us! We are very interested in your feedback, applications, improvement suggestions, and contributions! 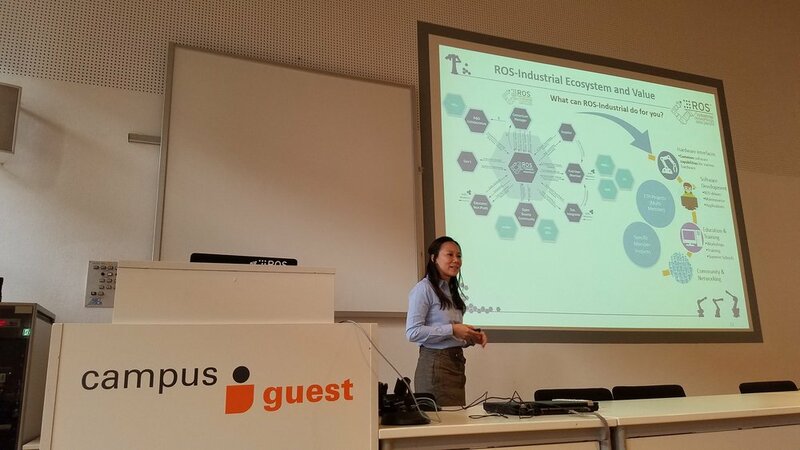 The ROS-Industrial Conference 2017 was held last week, and once again it grew bigger compared to the previous year’s edition. It expanded to a three-days event, with 28 talks attended by more than 110 participants from both industry and applied research organizations. The talks covered a wide range of topics including technical aspects of open-source robotics, as well as non-technical ones like community dynamics and business viability, application-oriented aspects and future challenges for open-source robotics, like safety and security. Here follows a selection from some of the topics and the side events covered during the conference. Matt Robinson, Program Manager for the ROS-Industrial Consortium Americas, described how ROS-Industrial has provided large players in manufacturing, who have struggled introducing automation, with an opportunity to introduce agility to manufacturing operations, hence improving utilization of resources and a broader impact on the overall value stream. 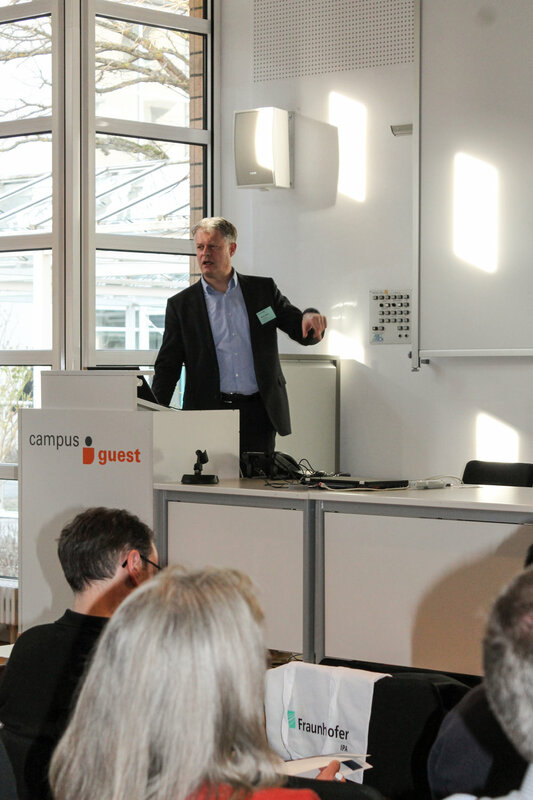 Martin Hägele, head of department robot and assistive systems at Fraunhofer IPA, gave an overview about ongoing developments in the global robotics market. He addressed both industrial and service robots and presented data which the International Federation of Robotics (IFR) collects and publishes annually in the “World Robotics Report.” Jaime Martin Losa, CEO of eProsima, showed how Micro-ROS bridges the technological gap between the established robotic software platforms on high-performance computational devices and low-level libraries for microcontrollers. The first day ended with guided tours the Robotics Lab, the Application Center Industry 4.0 and the “Milestones of Robotics” exhibition at Fraunhofer IPA. Min Ling Chan reported on how the ROS-Industrial Consortium in Asia Pacific is setting its objective and strategy towards understanding the industry needs in this region. Dirk Thomas from the Open Source Robotics Foundation introduced the forthcoming ROS2 which will provide notable advantages over ROS1, such as support for multiple operating systems and for DDS rather than a custom built middleware. Torsten Kröger, former Head of the Robotics Software Division at Google and now professor at the Karlsruhe Institute of Technology (KIT), showed examples and use-cases of manipulation and human-robot interaction tasks in order to provide a comprehensible insight into deterministic robot motion planning for safety-critical robot applications. 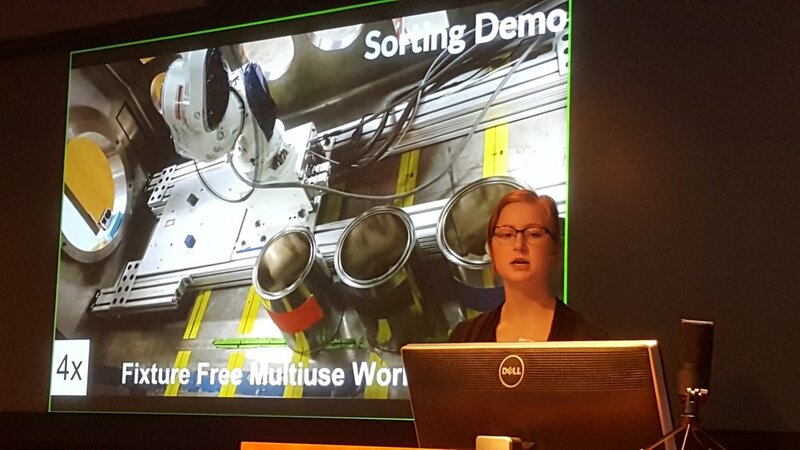 As part of the ROSIN project Yvonne Dittrich, professor at University of Copenhagen, investigates how the ROS community takes care of quality and presented her preliminary findings. After some demonstrations of ROS-native hardware and installations the second conference day closed with a stroll through the Stuttgart Christmas market and the social dinner. Felipe Garcia Lopez, researcher at Fraunhofer IPA, gave insights into the Cloud Navigation he developed for mobile robots in intralogistics applications. Communication via cloud between mobile systems operating in the same traffic area enables efficient interaction without idle times even with dynamic obstacles present. Finally, Kimberly Hambuchen, Principal Technologist for Robotics in NASA’s Space Technology Mission Directorate (STMD), and Martin Azkarate from the European Space Agency (ESA) showed which requirements on software frameworks for space robotics currently exist and presented information on how NASA is using ROS for robotic prototypes for future space exploration missions. As the event was sold out a week before the event started, we plan on hosting it on a bigger scale next year, while still targeting an early December timeframe. For your reference, the detailed agenda of the whole event as well as all slides from the speakers can be found here. Another ROS-Industrial Developer Class took place on October 10th at the Caterpillar Visitor’s Center in Peoria, IL. It consisted of a three-day program that provided basic and advanced track offerings. Day 1’s basic track covered several key ROS concepts such as messages, services, and nodes. At the end of each section students were given lab exercises allowing them to incrementally build a ROS application. The advanced track focused on building a perception pipeline from the ground up using the Point Cloud Library to process 3D sensor data. Day 2 delved into creating a robot model using URDF and Xacro files and doing intelligent motion planning using MoveIt! Furthermore, this class also included a section on process path planning using the Descartes Planning Library. On Day 3, students were given three lab programming exercises where they had the opportunity to create applications that combined perception and robot motion-planning concepts covered in the course. Two UR5 robots were made available so students could run their completed ROS applications on real hardware. The attendees were from various organizations, including Caterpillar, Boeing, ABB, IDEXX Laboratories, Magna, and Tormach. We extend our thanks to all of them for attending and for their positive feedback. The class curriculum can be found here. 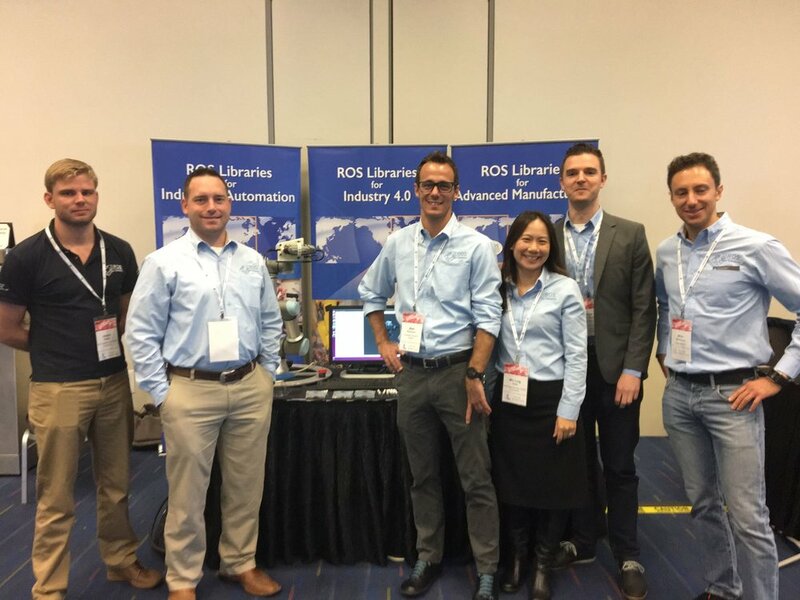 ROSCon 2017 was recently held in Vancouver, Canada, and has become a marquee event for all things ROS over the years. Hosted by OSRF, this event is a key place to hear the latest developments within the ROS community, while enabling richer networking and collaboration related to robotics, path planning and, really, any area where ROS can be leveraged, be it in industry, hobbies, education, humanitarian services, or life sciences. 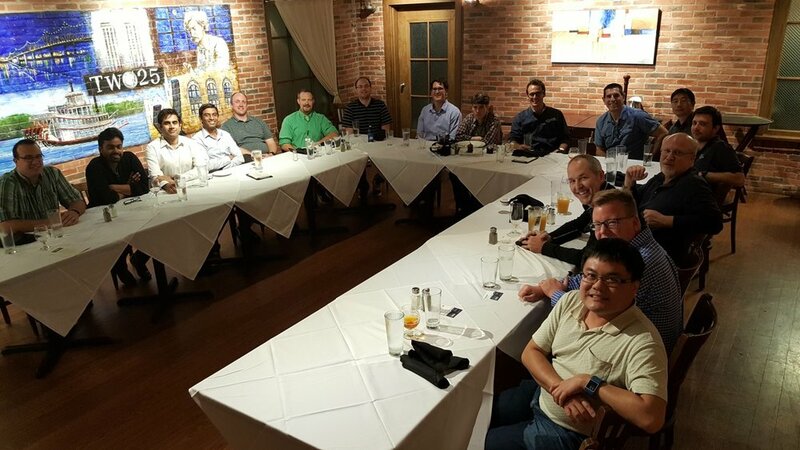 This was also one of the rare times where ROS-Industrial’s global team was able to get together face-to-face, both as ROSConn participants, and also to collaborate and set forth plans relative to the future of ROS-Industrial. Fraunhofer IPA supported the booth and the sponsorship for ROS-Industrial for this event. The booth was well-trafficked, and each Consortium— Americas, Europe, and Asia-Pacific— contributed to making the booth a success, including a Scan-N-Plan demonstration on a UR3. The ROS-I team supported three different talks. Gijs van der Hoorn supported the talk “How ROS Cares for Quality,” which is part of the EU2020 project ROSIN. Levi Armstrong presented “Robotic Path Planning for Geometry-Constrained Processes” and, finally, Mirko Bordignon, Min Ling Chan, and Matt Robinson presented an update on the ROS-Industrial Consortium and its success at leveraging private and public funding. ROS-I members left to right: Joseph Polden, ARTC-A*Star; Levi Armstrong, SwRI; Matt Robinson, SwRI; Min Ling Chan, ARTC-A*Star; Gijs van der Hoorn, TU Delft; and Mirko Bordignon, Fraunofer IPA. ROS-I members left to right: Name, company; Levi Armstrong, SwRI; Matt Robinson, SwRI; Min Ling Chan, ARTC-A*Star; Gijs van der Hoorn, TU Delft; and Mirko Bordignon, Fraunofer IPA. ROSCon provides a pulse for the trends shaping the ROS development community in coming months and years. There was a lot of buzz about ROS2 with presentations on related middleware, components, and novel applications. Some ROS-Industrial team members who attended the event provided observations on this and other topics of interest. Levi Armstrong, SwRI ROS-I Technical Lead: There was a lot of interest in ROS2, which we have not used on the projects we have developed historically. However, I do think it would be good to begin doing some work with ROS2, mainly to advance capabilities for our clients and open the door to new areas of work. There are opportunities to weave in the ROS2 work for a new driver for the Motoman running a ROS2 node directly on the controller. We heard sincere and significant interest from the start-up community in ROS-Industrial and understanding how to engage the Consortium. There was particular interest in a vehicle or means to join the Consortium with less of an up-front cash consideration for start-ups.In parallel, there is an expectation or desire for a more "industrial" feel relative to documentation and response to issues/requests. We also heard increased interest in Smart Factory/Industry 4.0-type applications requiring movement of information from engineering and order-to-delivery systems to have systems "take action" or to enable dynamic optimization. Regarding the significant activity in ROS2, it will be meaningful for ROS-I teams to consider test cases, or pilots and actively engage in ROS2. ROSCon underscored the importance of accelerating our work with ROS2, both technically and with policy/roadmap/planning. People still struggle to understand what is “industrial” about ROS-I and,by extension, why they should be interested in ROS-I. The ROS community has -- even more than in previous years -- become a consumer-first community; the number of (structural) contributors is very, very low. And even though there are quite a few companies that use ROS, their contributions to the community are limited. Even for larger entities, they really only touch what they directly need, at that instant, for their own purposes. There needs to be a means to encourage and develop the companies that drive the excitement around ROS & ROS-I to demonstrate the value of being a proper community member. The ROS-Industrial team also held a working leadership group session the following day. Topics covered for growth are the means to encourage effective community engagement and contribution, particularly among OEMs. For functionality to really take off and meet the needs of ROS-I stakeholders, OEM support and engagement is critical. Finally, ROS2 and broader industrial hardware integration and strategy was discussed. Migration of communication tools such as the retiring of the ROS-I/SwRI Google group was also settled with a migration to Discourse slated for January 2018. Follow-on communications are in the works relative to the output of this meeting and follow-on working sessions to continue to improve ROS-I and the vision supporting its growth. ROSCon was a valuable opportunity to learn about the community that makes ROS unique, the startups that are innovating in the commercial marketplace, the leadership of OSRF, and other ROS stakeholders seeking to continue the upward trajectory that the robotics community is already on, and we are excited that ROS-I has become a key part of that. The first ROS-Industrial Developer's training in Singapore - A Success! The ROS-Industrial Asia Pacific Consortium has launched it's first developer's training in Singapore. The training was sold out during the week before the training was kick-started. To be conducted annually or on request by companies, it consist of 3 days of training presentations, lab exercises and eventually testing your code on a robot. In the case here we were using a UR5 to test the participant's code. The success lies in the feedback and the creative energy from the participants to ensure that they continue to develop in ROS and use it for their applications. The 1-Day advanced training in Path Planning and Perception is new this year by ROS-Industrial and with the help of Levi Armstrong, SwRI (ROS-Industrial Americas) we were able to roll this out in Singapore. The additional advanced training allowed participants to delve into the key concepts for path planning and perception. Many thanks to trainer Levi Armstrong for travelling to Singapore to perform this training. Thanks to our ROS-Industrial AP Consortium developers Joseph Polden and Conghui Liang for their help as training assistants.. The training curriculum is open-source and available here. If you are interested in attending the next class in October, keep an eye on this event page. 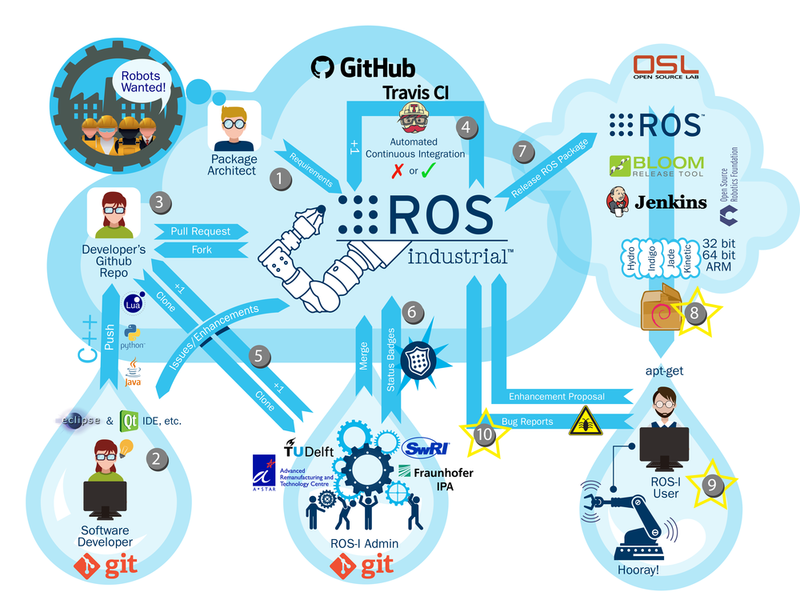 This is the last post in a series detailing the ROS-Industrial software development process. We will discuss publishing and installing software. The first post described the process of contributing code to a project (item 1-3 in the figure above). The second post described the process of Continuous Integration, Pull Request (PR) peer review , and the release of a given repositories packages by the maintainer (item 4-7). Note that the starred numbers in the software development process illustrated above correspond to the outline below. The ROS-Industrial Consortium Americas hosted a ROS-Industrial Developers Training Class June 6-8, 2017, at SwRI in San Antonio, Texas. 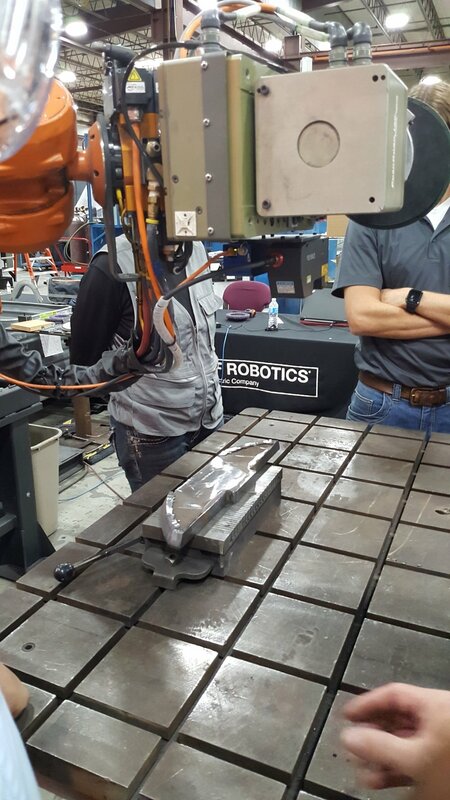 Twelve attendees represented a diverse set of organizations, including Bastian Solutions, EWI, John Deere, PlusOne Robotics, Magna International, Rensselaer Polytechnic Institute, The University of Texas at Austin, and Yaskawa America’s Motoman Robotics Division. The three-day class was geared toward individuals with a C++ programming background who sought to learn to compose their own ROS nodes. Day 2 examined motion planning using MoveIt! as well as using the Descartes planner and perception concepts. Day 3 included an introduction to perception and culminated with lab programming exercises with a choice of Pick-and-Place Application or Descartes Application. Many thanks to training class leaders Jeremy Zoss and Austin Deric. The training curriculum is open-source and available here.